Todd Strier’s new APP was developed specifically for DSNY. It helps in the event of any LODI incident. Protect yourself now! Todd Strier’s new APP was developed specifically for DSNY. It is critically important for Sanitation Workers or Officers who suffer a LODI to get help quickly. 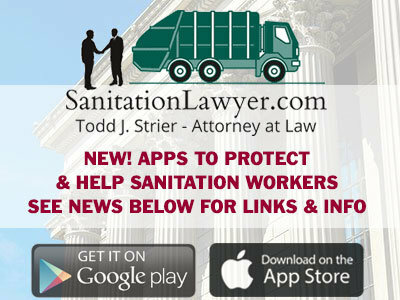 Our “LODI Checklist” APP is important for any Sanitation Worker or Officer. Follow the important steps, take photos, record voice memos, and contact Todd Strier! (Both Apps are Free! – Download Links are Below).